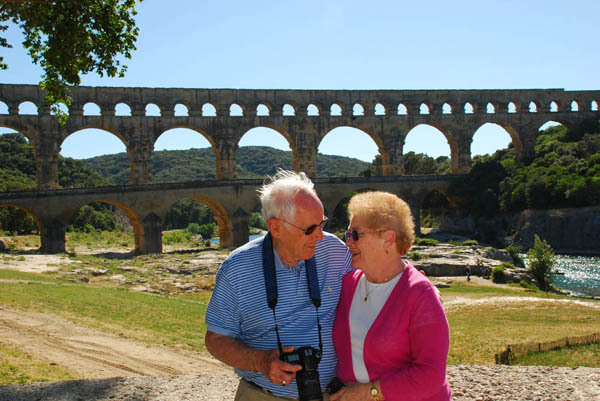 The Pont du Gard is a notable ancient Roman aqueduct bridge that crosses the Gard River in southern France. It is part of a 50 km (31 mi) long aqueduct that runs between Uzès and Nîmes in the South of France. 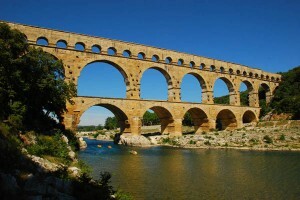 It is located in Vers-Pont-du-Gard near Remoulins, in the Gard département. The aqueduct was constructed by the Romans in the 1st century AD and was added to UNESCO’s list of World Heritage Sites in 1985. It is the highest of all Roman aqueduct bridges and is the best preserved after the Aqueduct of Segovia. The Pont du Gard’s subsidiary function as a toll bridge ensured its survival in the Middle Ages. Although some of its stones were looted, the local lords and bishops were for centuries responsible for its upkeep in exchange for the right to levy tolls on travellers using it to cross the river. It attracted increasing fame from the 18th century onwards and became an important tourist destination. It underwent a series of renovations that culminated in 2000 with the opening of a new visitor centre and the removal of traffic and buildings from the bridge and the area immediately around it. Today it is one of France’s most popular tourist attractions. We visited this magical place on May 16. Amazing on the first, second or third sighting. 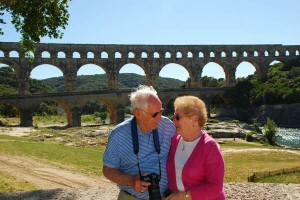 Posted in France Tours and tagged france, pont du gard.